What's Wrong with Alternative Medicine? If unconventional therapies like acupuncture can make patients feel better by bringing them a vague sense of well being, why not let them? Some scientists say we shouldn't. It's safe to say that most everyone allows for some form of mysticism in their lives. If you'll permit the oversimplification, one can imagine a spectrum of tolerance: At one extreme we have those who welcome with indiscriminate, crystal-clutching gusto the spiritual, the transcendent, and the utterly bogus. At the other end stand the most fanatical of skeptics, the ones who revel not so much in ruining your fun as nuking it from orbit in an eye-rolling fit of vitriolic contempt. Everyone else lands somewhere in the middle. Yes, even skeptics can and do abide their fair share of woo. Pedantry, after all, is exhausting business, and there will always be in-laws to brave, bosses to appease, and friends to forgive of their faults. Most of us come to rest at a balancing point between faith and empiricism that permits us to navigate our daily lives with friendships, jobs, and familial relations more or less intact. For many people, I'd wager that compromise is roughly in keeping with that arrived at by science writer Jennifer Holland. "There's nothing wrong with a little hippy-dippy description now and then," she muses, in a recent essay that investigates what science can tell us about yoga's power to wring emotions from our bodies (spoiler: so far, it can tell us nothing of the sort). Such compromises may be defensible to a point – that is, to the extent that the underlying precepts of the mysticism in question are benign. The persistence of rhino poaching in Africa – a vile and vicious business propagated, in large part, by the superstitious use of the animals' horns in Traditional Chinese Medicine – underscores the fact that this is not always the case. But this is an extreme example. It's safe to assume no rhinos are slaughtered as a result of anyone's yoga practice (at least not directly). In fact, the same might be said of many forms of complementary and alternative medicine (CAM), the majority of which lend themselves to all manner of untestable spiritual and metaphysical interpretations. These therapies are largely defined by a lack of scientific evidence in support of their effectiveness. Others actually fly in the face of basic scientific principles. It is rare, however, for any CAM modality to be used as an outright substitution for mainstream medical treatment. The National Institutes of Health's National Center for Complementary and Alternative Medicine (NCCAM) estimates nearly 40% of Americans now supplement their health care with "approaches developed outside of mainstream Western, or conventional, medicine." If these unconventional therapies make patients feel better by bringing them a sense of well being, why not allow them? According to David Gorski, a surgical oncologist and professor of surgery at Wayne State University, this brand of permissiveness has allowed complementary and alternative medicine to not only infiltrate but undermine the worlds of medical and academic science. "A lot of doctors and scientists don't pay attention to this stuff," says Gorski, who also serves as managing editor of Science-Based Medicine, a website devoted, in large part, to debunking CAM therapies. He has a name for people he says recognize CAM treatments as pseudoscience but don't feel compelled to say so to their patients or colleagues – he calls them "Shruggies." According to Science-Based Medicine writer Val Jones, who coined the term, Shruggies "should soberly consider whether or not it's ethical to remain indifferent and/or silent on the matter" of pseudoscientific tolerance in the scientific and medical communities. "Perhaps you don't realize how hight the stakes are," she writes. "The very foundations of the scientific method and the integrity of our professions are indeed being attacked." "Integrating' pseudoscience with science-based medicine isn't going to make science-based medicine better," Gorski explains. "One of our bloggers, Mark Crislip, has a fantastic saying for this: 'If you mix cow pie with apple pie, it does not make the cow pie taste better; it makes the apple pie worse.' With CAM or 'integrative medicine,' that's exactly what we're doing, and these clinical trials of magic are just more examples of it." The piece can be read in its entirety here, but the upshot is as follows: Gorski and Novella present two examples of CAM that have received significant attention from the scientific community, namely Reiki and homeopathy. Reiki is classified by the NIH's National Center for Complementary and Alternative Medicine (NCCAM) as an "energy medicine," and involves "using hand and touch to direct into the patient's 'healing energy' from what Reiki masters call the 'universal source'." Homeopathy hinges on concepts that NCCAM concedes "are not consistent with fundamental concepts of chemistry and physics." And yet, the hand-wavy nature of these treatments has not prevented them from being tested in multiple randomized control trials. Several such trials, Gorski and Novella point out, have even received funding from NCCAM. Also known as RCTs, randomized control trials are the gold standard for evaluating the effectiveness of a medical intervention. Unsurprisingly, the authors write, results from RCTs of homeopathy and Reiki "tend to be inconclusive or negative." The odds of most CAM modalities having a positive effect greater than placebo is negligible, if not zero, argue Gorski and Novella. To conduct an RCT, they say, is therefore more than just uncalled for. It's unethical. "Everyone knows that funding for scientific research is limited," says Gorski. "In that light, is it really worthwhile to spend money researching therapies whose concepts conflict with our understandings of basic science and physical reality?" Take away the magic, Gorski says, and a lot of what you're left with is the "mundane stuff," that isn't really alternative – things like diet and exercise, neither of which needs a special label like "CAM" to be studied. "Take yoga," he says. "The problem with yoga is when it's sold as a package with mystical beliefs that are said to be essential." Strip yoga of its mystical elements, he says, and you're basically left with exercise. "And nobody has any issue with exercise." The habit of lumping "mundane stuff" in with CAM, he continues, is closely related to the field's tendency to "medicalize things that were not formerly considered medicine." He points to massage as an example. "I don't think there's anything inherently wrong with massage," he says. "But when you start making specific therapeutic claims for it, you are, in essence, medicalizing it." Same goes for things like music therapy and art therapy, he says "which are often lumped with CAM for reasons that I can't understand. You know things that were formally used just to make patients feel better are becoming medicalized, under the rubric of CAM." According to Josephine Briggs, Director of the National Center for Complementary and Alternative Medicine at the National Institutes of Health, the "CAM" designation is an "arbitrary and historical distinction." So why call it that at all? "The point," she says, "is that there exists a part of the NIH whose challenge it is to evaluate ideas that conventional medicine has not considered or studied, to see whether they work or are helpful." This is a mission she believes the rigorous requirements of basic research can accommodate. "I certainly agree that the starting point for research has to be scientific plausibility," says Briggs, and the amenability of the approach to scientific research. She also agrees that CAM can be harmful when it replaces scientifically supported therapies. "I'm horrified when I read or hear bout alternative therapies that are marketed or pushed when there is effective good therapy for that disease." Take the cancer arena, she says, where alternative, herbal, or other hocus-pocus therapies are often pushed on people that are sick and vulnerable to charlatans. This, she says, "is offensive quackery, and I don't disagree with Gorski and Novella that it's a terrible thing." Still, she objects to the tone of Gorski and Novella's editorial, and several of its implications, which, she says, are not "fully correct." The NIH, for example, has not funded interventional studies on Reiki or homeopathy "in a long, long time," according to Briggs. Referencing it the way Gorski and Novella do, she says, "is a little disingenuous." "We work hard to make sure that the resources we oversee, which are modest, are carefully distributed," says Briggs. (In 2013, NCCAM's $123.8-million in funding accounted for roughly 0.4% of the total NIH budget.) This, she says, is reflected by how judiciously NCCAM guards its funds. "We fund between 8 and 10% of grants that are submitted," she explains – "that's the lowest funding success rate at the NIH." Asked whether these percentages reflects the rigor of NCCAM's review process, the questionable merit of the research proposals NCCAM receives, or some combination thereof, Briggs responds that "it reflects the fact that our peer review councils look very carefully at proposed work, and only fund work that they determine to be of very high quality." Clinical research can never prove that an intervention has an effect size of zero. Rather, clinical research assumes the null hypothesis, that the treatment does not work, and the burden of proof lies with demonstrating adequate evidence to reject the null hypothesis… Clinical research may not be able to detect the difference between zero effect and a tiny effect, but at some point it becomes irrelevant… after decades of research and more than 3000 trials, acupuncture researchers have failed to reject the null hypothesis, and any remaining possible specific effect from acupuncture is so tiny as to be clinically insignificant. Briggs disagrees. "NCCAM has funded a number of studies on acupuncture," she says. 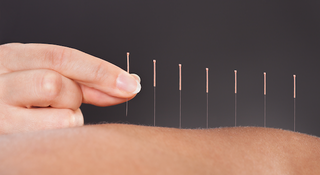 "I think that the evidence that acupuncture can serve as an irritant stimulus, as well as a ritual that changes people's expectation, has some plausible reasons why it may modify pain." The data is "certainly not overwhelming," she concedes, but she does think the pain-reducing effects of acupuncture are "scientifically plausible." Besides, she says, " I am less concerned with somebody going to an acupuncturist, or even a Reiki practitioner, than I am about the number of physicians in this country who are over-prescribing opioids." This, she says, is one reason more than a third of NCCAM's funding goes toward the study of pain management. "By the way," she adds, "if you think like a physician, are you really going to turn a patient away from acupuncture if he thinks it's working for him?" Notwithstanding his opinions toward Shruggies, Gorski says he "actually kind of understands" Briggs' point. Competent adults, he says, can obviously choose to do whatever they want, whether it's regular medicine or quackery. "What is needed, and often not given," he says, "is true informed consent to make that choice." Read Gorski and Novella's editorial in the September issue of Trends In Molecular Medicine. Briggs points to a number of ways that NCCAM works to provide patients with the informed consent Gorski calls for, including information on CAM therapies; tips on whether and how to use complementary health products and practices; and safety information for a variety of products and practices.